Authority fields indicate the tags and subfields that should be entered in the authority record. 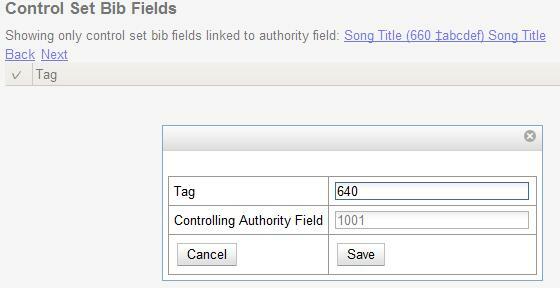 Authority fields also enable you to specify the type of data that should be entered in a tag. For example, in an authority record governed by a Library of Congress control set, the 100 tag would contain a "Heading - Personal Name." Authority fields also enable you to create the corresponding tag in the bibliographic record that would contain the same data. Click Admin → Server Administration → Authorities → Control Sets. Click Authority Fields. The number in parentheses indicates the number of authority fields that have been created for the control set. Add a Name to the authority field. Enter any number of characters. Add a Description to describe the type of data that should be entered in this tag. Enter any number of characters. Select a Main Entry if you are linking the tag(s) to another entry. Add a tag in the authority record. Add a subfield in the authority record. Multiple subfields should be entered without commas or spaces. Add either a value of 1, 2, or leave empty if not applicable for the Non-filing indicator field to denote the which will be the non-filing indicator. Create the corresponding tag in the bibliographic record that should contain this information. Click the None link in the Controlled Bib Fields column. Click New Control Set Bib Field. Add the corresponding tag in the bibliographic record.